The International contest Global Arctic Awards 2013 is the contest of Arctic and North pictures,it is open to all photographers around the world. The theme of the contest is Arctic and North pictures. The contestants’ images will show the diversity of the beautiful nature and animal world, tell about the peculiarities of “icy” life of the Arctic, narrate the unforgettable photo stories about the culture, everyday life and centuries-long traditions of the sparse inhabitants of the North. PSA Travel The Arctic: Images taken in the northern polar region of the globe including the edges of the Eurasia and North America continents and the territory of the Arctic Ocean. Polar Bear: Images of a Polar bear in his natural habitat in the Arctic. PSA Travel Northern Civilization: Pictorial images of the northern cities, settlements, buildings, industrial objects, deposits. PSA Travel Global warming: Series of images telling about the main problem of the Arctic: global changing of climate and ice melting. Images of interaction of a human being and nature. Human impact on the nature and environment of the North and Arctic. RPS Ethnos :Life and culture of the sparse inhabitants of the North, ethnography. Special section “Yamal in lens” – images taken on the territory of Yamalo-Nenets Autonomous Okrug, Russia, at different time. PRIZE DETAILS: 6 FIAP special medals. 12 PSA medals: 4 gold medals, 4 silver and 4 bronze medals. 6 RPS medals: 2 gold, 2 silver, 2 bronze. 12 gold UPI medals and 20 UPI Honorable Mention certificates. 9 PSA and RPS ribbons. 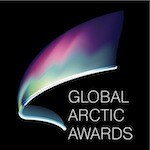 Global Arctic Awards statuette to Arctic photographer of the Year. "Best Arctic photographs 2012" book to all 1st place winners. Annual "Foto & Video" magazine subscription to the winners of FIAP Northern landscape section. Trip to West Greenland with Oceanwide Expeditions company in September 2014. Trip goes to Arctic Photographer of the Year. Nokia Lumix smartphone from Visit Finland company. Smartphone goes to the winner of Northern Lights section. JPG format; Size of digital files: minimum 1024x768 pixels, maximum 300 KB., 72 DPI. Not eligible to enter? - Find contest where you are. Reproduce winning images in the photo albums, informative brochures, digital media and other publications related to the contest and exhibitions; Use winning images for further specialized activities , aimed at the popularization of the contest; Offer the options for the commercial usage of the images to their authors. Exhibition copies to be shown at the exhibition and printed at the cost of the sponsors of the "Global Arctic Awards" contest will remain with sponsors and may be used within the framework of the competition activity.